I am saddened to report that the Devilishly funny and charming Maureen Johnson is the latest of our fellow-author-compadres to get whacked by the great Book Ban Whiffle Bat. Please read her post to find out how and why her lovely novel, The Bermudez Triangle, has been yanked from the shelves of a school library in Bartlesville, Oklahoma. I call it the Book Ban Whiffle Bat for this reason: It looks like a bat; it swings like a bat, but it's full of air, people. There's no substance to it. And why is there no substance? Because, We the People are in America here; we have First Amendment rights and civil rights and separation of church and state. It's Not Okay to ban books from school libraries. The law says so, the courts say so. This horse left the barn a long, long time ago, when the framers of the ol' Constitution whacked it on the rump and said Run! Carrots thataway! And yet. Sometimes, people — in the case of Maureen's book, it was a mother of a high school student — make the MISTAKE (I will call it a mistake, because that's what it is) of confusing their own private choices and beliefs — their personal rules — with matters of law. The Big Rules, let us call them. The ones we play by as a nation. This is definitely a mistake. Because if I say my kid can't watch Family Guy, that's something different than saying Family Guy is (or should be) against the law for anybody to watch. I'm allowed to tell my kid he can't watch Family Guy. Family Guy may be against my personal rules (it's not; by the way, I think it's frikkin' hilarious). It may be against the rules I set for my kid. But it sure isn't against the law, and I can't have the show taken off the air just because I personally don't want to watch it. I am, myself, a vegetarian. Sirloin steak is against my personal rules. But it isn't against the law; nor should it be. So: Mistaken Mom says that she does not want her kid reading a book with (gasp!) homosexuals in it. Think what you will about this; it's Mistaken Mom's homophobic opinion and her kid is probably watching Queer as Folk at a friend's house and planning to move to Chelsea after graduation; these things have a way of evening themselves out. But Mistaken Mom, being unclear about which are personal rules and which are Big Rules, writes a letter to the school saying the book with homosexuals in it that's against her personal rules must be REMOVED FROM THE LIBRARY. Banned, verboten, locked away where the sun don't shine. Big deal, you say. Mistaken Mom wrote a letter she shouldn't have written. She mixed up her personal rules with the Big Rules, the laws everybody has to follow. Waste of a piece of paper and a stamp, pass the chips. But no. It didn't end there. Mistaken Mom made what you might call a Gateway Mistake; it led to a bigger and MUCH more serious mistake, which was this: The school caved. The Bermudez Triangle has been pulled from the library. Now we got trouble, because the school is not a person with personal rules. It is a public institution, and it has to play by the Big Rules. It Has To. And the Big Rules say that book banning violates the First Amendment rights of students. Period. Mistaken Mom mouthed off, and that's her right as an Ammurrican. Mistaken School Officials have acted in an unlawful way, and serious consequences can rightly rain down upon their heads. Wake up, School Officials! Know the law, know your students' rights. Don't subject your school district to costly lawsuits that only prove over and over again what we as a nation have known for a couple of centuries now: This is America. Land of the free, home of the brave, freedom of speech, separation of church and state. Teens have civil rights too. Gay teens, let it be said, have civil rights. There are other ways of placating a grumpy parent than messing with the Big Rules of our country and digging your school deep, deep into a hole of We Done Wrong. I disagree heartily with what Mistaken Mom says, but I defend just as heartily her right to say it. You people who run the schools, though — you really should know better. AP American History, anyone? Princeton Teen Book Bash is coming up soon! OMG! The Princeton Teen Book Bash is shaping up into the event of the season! It's Saturday, May 5th, at the Princeton NJ Library, from noon until five. Expect a full day of scads of YA authors reading and signing books, a full day of live performances by dazzling local talent —it's a full day, is my point! Well worth a trip. I'll be there all day signing, and reading from Why I Let My Hair Grow Out at 4:30, right after Ned Vizzini. A detailed schedule of the day's readings, participants, directions to the library, and all that jazz is on the fab Book Bash website — please check it out! Hope to see you there. John Lennon's Piano - the Peace Tour in D.C. I had a brief and lovely weekend trip to Washington D.C. Many things happened while I was there, some moving, some amusing, some bookish, and I was planning to post about them in my usual merry way now that I'm home again. This is the piano upon which John Lennon wrote the song "Imagine." The piano is currently owned by George Michael. With help of some human minders, John's piano is currently making a "peace tour." That means that the piano's caretakers are bringing it to sites where acts of extreme violence have occurred. Once there, they make the piano freely available for people to touch, play, sing with and talk about. They're photographing and videotaping people's reactions and interactions with the piano for a future book project. I had the chance to meet John Lennon's piano over the weekend as it sat on the sidewalk in front of Ford's Theatre, in D.C. This is the theatre, in case you've forgotten, in which Abraham Lincoln was assassinated. The night I was there happened to be the 142nd anniversary of Lincoln's death; hence, a perfect time for the piano's visit. When I spoke to the woman who was managing the event, she mentioned Columbine, the World Trade Center site, and of course the front of the Dakota apartment building in New York City (where Lennon himself was murdered) as planned sites for future visits. Here's an article about the peace tour. 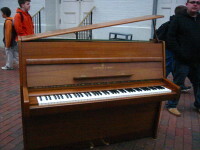 Tragically, today's shootings may have earned the Virginia Tech campus in Blacksburg a visit from the piano. May John Lennon's timeless vision of a world free of such horrors endure, take root, and flower. Imagine.